It will be great to be all together again and to catch up on the past five years of everyone’s lives. For us, after being retired for awhile, all I can say is, “Life IS good”. This may have been the best five years of our lives so far and it looks to be getting better and better as we go along on this path! The focus of these years has been family and friends and each has become a more and more special place in our hearts. We are truly blessed when it comes to grandchildren. We have 10 now and another new one to be born in September. We can hardly wait! Being a grandparent is really something special. Molly’s little one, Matthew, calls Jim, Mr. Grampa Moustache!! Our lives have been enhanced by our continuing friendship and travels with Harriot Hagedorn and Leonard Askham, Polly and Tom Crowley, and Mary Liz (Hann) and Mike Mattoon. We have camped and 4-wheeled together in areas around northern Idaho and Montana and built huge “Jim fires” to keep us warm and dry. 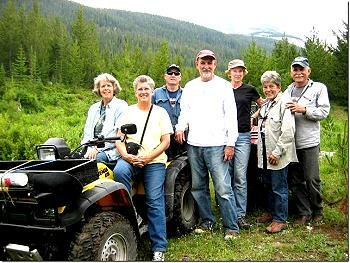 We all ventured one winter to McCall to feed elk on Kathy (Neely) Point’s ranch. The girls have continued to take trips together, as well, to the Olympic peninsula, the Oregon coast and quilt camp on Coeur’d Alene Lake among others. And as we travel we seem to “collect” fabric and have sewn quilts that each of us have contributed to. They are truly treasures because we have a little part of each other in each one. These friendships mean the world to me and to think, as with Polly, they started at birth and have only grown more wonderful since then! We are constantly planning when we all get together, so I know that there’s more travels and camping adventures down the road for all of us! Our 4 daughters and families are scattered around the Pacific Northwest in Boise (Ginny), Portland (Jill), Sandpoint (Katie) and Tacoma (Molly). You will often find us on the road traveling to one or the others or they come here. 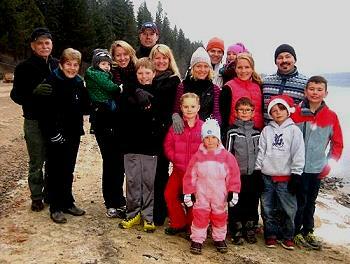 With families, they have now grown too large to have everyone at one time here in Elk City so we all gather together for holidays at a place that will hold this rumbustious and loving family! I’ve taken each of our girls on a mother/daughter trip and the last to go was last summer when Jill and I spent two wonderful weeks together in Spain. She’s now pregnant with our newest grandchild so our timing was perfect! The girls think we should begin the “trip cycle” again and they are each ready to go on another trip, so I know they enjoyed the ones to the Bahamas (Ginny), Greece (Katie), Croatia-Albania-Montenegro-Greece (Molly) and Spain (Jill). The real joy of my life continues to be my wonderful husband, Jim. I don’t know how I was so lucky to get such a gem of a husband. We just returned from a 7 week, 8,000 mile trip in our little Airstream to Alaska. Truly a trip of a lifetime, but the best part after being together 24/7 for 7 weeks we still like each other and we are still talking!! In September we are headed to Quetico Wilderness Provincial Park in Ontario to canoe for two weeks. This will be our 9th trip in and we love that area with it’s quiet and loons. As long as Jim can portage our canoe we’ll continue to canoe there. Another love of ours is following Gonzaga basketball – Go Zags! (What else is there to do in the winter in Elk City?) When Polly and Tom and Jim and I attended the West Coast Conference Championships in Las Vegas last March we ran into John Hutchins and Michelle Connelly. Quite the Moscow High contingent!! We are headed that direction next year as well. Anyone going?? As the reunion approaches, so does my excitement to see everyone again and catch up with each of you! Remember that Elk City is a small place but we’d love to have you visit. Just stop at the Elk City Store and ask for directions to “Susie’s”. They’ll tell you how to get here!! We’d love to see you! Thank you to all who continue to do the hard work to make these reunions the success they are! Without all of you and all your efforts, we would not be able to continue to keep in contact. Thanks so much!! Most of our family: from left: Jim, Susie, Molly and Mark with Matthew (missing Peter-born 3/14/14), Ginny with Jack (Addy was at Borah (Boise) basketball camp), Katie and Brian with Winslow, Berkeley and Josie, and Jill and Shawn with Josh, Logan and Zach. Click on the Pictures below to vew enlarged versions. These are pictures of two quilts I designed for our Elk City quilt club to raffle off for fund raisers at Elk City Days. 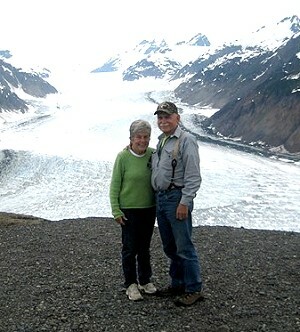 The moose center and the elk center were from Toni Whitney of Bigfork, Montana. 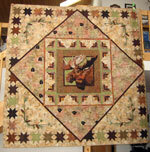 We raffled off the moose quilt in 2009 and made $3500 for our community and we're raffling the elk quilt this year. This picture is from my daughter Ginny's 40th birthday party. From the left are daughters, Katie Cox (holding daughter, Josie), Ginny, Molly, Jill and myself. How can five short years go by so fast? It'll be fun to get together with everyone again and catch up!! My passion in life continues to be my family. Our four daughters all live in the Pacific Northwest. Ginny is in Boise with two of our grandchildren and is senior president with Alouette Cosmetics. 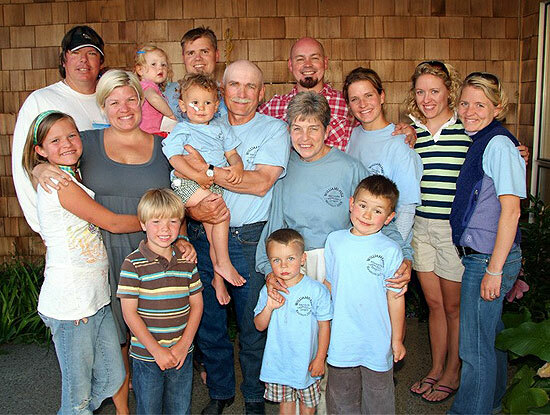 Jill is a full time mom in Portland with three of our grandsons. 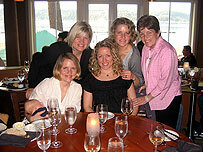 Katie is an architect with her own business, Studio 124, in Olympia, Washington and is mom to two of our grandaughters. Molly teaches junior and senior English at Bellermine Prep, a private Catholic high school in Tacoma, Washington. The past five years Jim and I have continued to enjoy our retirement. 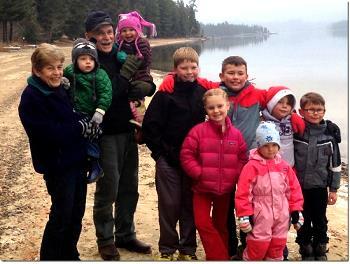 Most of the time has been spent being Grampa and Grandma to our seven grandchildren. Fortunately all of them are within a day's drive of Elk City. We've also enjoyed traveling to Alaska, to Scotland twice, canal boating in England and Wales, visiting friends and family around the United States and canoeing in Quetico Canoe Wilderness in Ontario, Canada. I've just returned from a trip to Croatia, Montenegro, Albania and Greece with my youngest daughter, Molly. It was a mother/daughter "fling" before her wedding next month. Jim and I still absolutely love living in remote Elk City, Idaho. We have a home 5 miles north of this small community. (If you ever get to Elk City, just stop at "The Store" and ask for directions to Susie's!) I enjoy quilting and Jim and I love canoeing and raising our garden (a challenge at this altitude!). We also backpack into the wilderness areas east of here. But our main interest continues to center around our children and our seven wonderful grandchildren who all love to come and visit. I appreciate all the time and energy the entire reunion committee and Bill and Connie have put into our 45th reunion (how can that be???). They do all the work and we just get to come and enjoy! Thank you!! 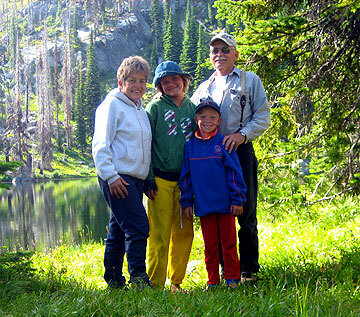 Ginny Lyke, age 41, married to Jim, parents of Addy, age 12 and Jack, age 8, lives in Boise, Idaho. Jill Mann, age 37, married to Shawn, parents to Zach, age 8 Logan, age 5,and Joshua, age 4 lives in Portland, Oregon. Katie Cox, age 35, married to Brian, parents of Berkeley, age 4 and Josie, age 1 - lives in Olympia, Washington. Molly Egland, age 30, lives in Federal Way, Washington. Will be married on August 7th to Mark Coyne. How can it be? At one of our past reunions I received an award for the youngest child. That baby turned 30 this summer! How can that be? Can time actually pass that fast??? 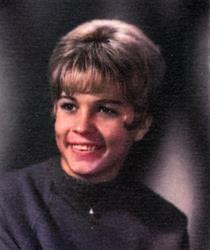 After graduation from Moscow High, I attended the University of Idaho graduating in 1969 with a degree in education. I began my teaching career in Colton, Washington followed by 16 years at Moscow Junior High. My first marriage to John Egland ended in 1982 but was blessed with four wonderful daughters. In 1988 I married the best guy in the entire world, Jim Borowicz, and moved to Elk City, Idaho where I taught and was principal of Elk City School. 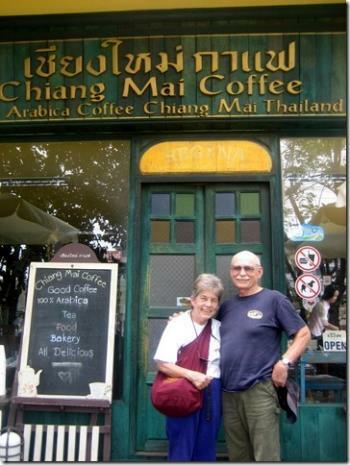 In 2002 I took early retirement (and love it!!!) and had a wonderful opportunity open to me. I was asked to be project coordinator for the 2003 Capitol Holiday Tree, the first Christmas tree to grace the lawn of our nations capitol building to come from the State of Idaho. It was quite an honor and a wonderful experience. Idaho school children made over 8,000 ornaments and in November 2003, we took the tree to 54 Idaho communities and 9 communities across the nation. I was very proud to be from Idaho and get to accompany the tree on its trip and be there with my family as the Speaker of the House and two Idaho school children flipped the switch to light the tree. 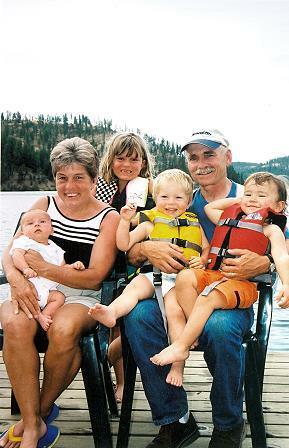 On our trip around Idaho, Tom and Sandy (Anderson) Coates met us in Challis and Michelle (Connelly) Arnold met us in Coeur dAlene. My passion in life remains my family. My daughters all live in the Pacific Northwest. Ginny is in Boise with two of our grandchildren and is senior director with The Body Shop at Home, Jill is a full time mom in Portland with two of our grandsons and a new baby on the way in February, Katie just received her Masters degree in architecture from the University of Washington and opened her architecture business, Walker Architecture, on Bainbridge Island in June, and Molly just moved to Portland, Oregon, from New Haven, Connecticut where she was working at Yale University Press as an assistant editor. She is now attending the University of Portland working on her Masters degree in Education. Jim and I love living in remote Elk City, Idaho. Jim is the forester at Bennett Forest Industries and we built a home 5 miles north of this small community. Recently I have been working with groups here to promote forest health and last year testified in Washington, D.C. in front of the Senate Natural Resource committee about the forest conditions surrounding Elk City in support of a Senate bill. I enjoy quilting and Jim and I love canoeing. We also backpack into the wilderness areas east of here. We have had the opportunity to travel to Pakistan, Barbados, Scotland, Honduras, and Italy, and to Greece and the Bahamas on kayak trips with daughters. But our main interest continues to center around our children and our four wonderful grandchildren who all love to come and visit. I appreciate all the time and energy Bill and Connie have put into making our website and Im looking forward to seeing everyone at the reunion! An Idaho Tree in Washington DC.. The Idaho Tree after dark..
View from our home in Elk City..
Snowmobiling in Elk City with Mike and Michelle (Connelly) Arnold..